Coronal leakage is an important factor contributing to the failure of endodontic treatment. The use of an efficient temporary restoration between sessions of multiple-visit pulpectomies is irrefutable. Two cements have long been used in endodontics—IRM, which is a reinforced zinc oxide cement and Cavit G, a calcium sulphate based cement. 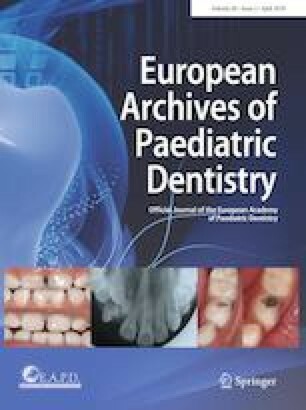 The aim of this study was to compare the microleakage of nano silver containing UDMA-based cements with routinely used zinc oxide and calcium sulphate-based temporary cements in primary teeth. Standardized access cavities of 3 × 3 mm were prepared in the sixty caries-free primary molars. The teeth were divided randomly into four groups of 14 teeth each—Group I: IRM, Group II: Cavit G, Group III: Orafil-G and Group IV: Dia-Temp. Temporary restorative materials were applied according to the manufacturer’s instructions. The teeth were subjected to thermocycling and then immersed in 0.5% basic fuchsin for 24 h. The specimens were sectioned and evaluated under a digital microscope at 20× magnification and were scored for microleakage. The collected data were tabulated and subjected to statistical analysis. Dia-Temp presented the least microleakage values. The highest score for microleakage was shown by IRM followed by Orafil-G and Cavit-G. There was a significant difference between IRM and Diatemp groups (p value = 0.009), and among Orafil G and Diatemp groups (p value = 0.025). Among the four materials tested, Dia-Temp exhibited the best sealing ability and its use is recommended in between sessions of endodontic treatment in primary teeth.